The solar project was originally planned only on a scale only large enough to run the Raspberry Pi web server to power this site. However, I had started the project in early December and even with a 100 Watt panel I was unable to generate enough power to maintain the single 75Ah battery due to the very short days and the sun being so low in the sky. This prompted me to buy a second, identical 100 Watt panel. When the days began to get a bit longer I then had the opposite issue whereby I was generating more electricity that I could store and use. 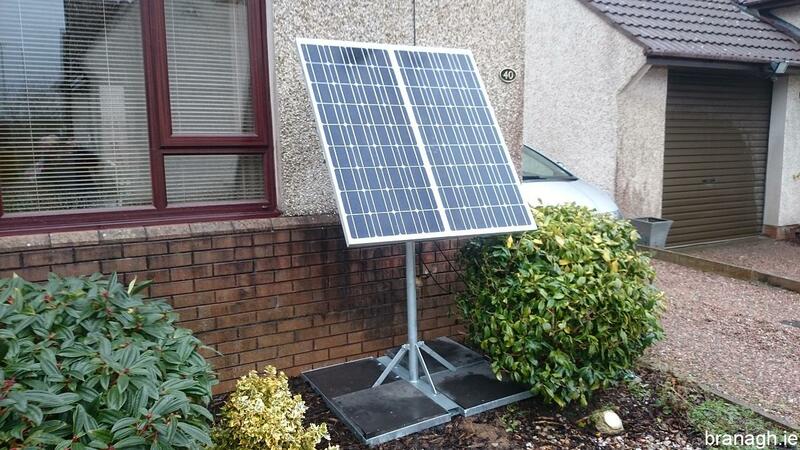 The 2 x 100 Watt solar panels, mounted on a satellite dish patio mount. 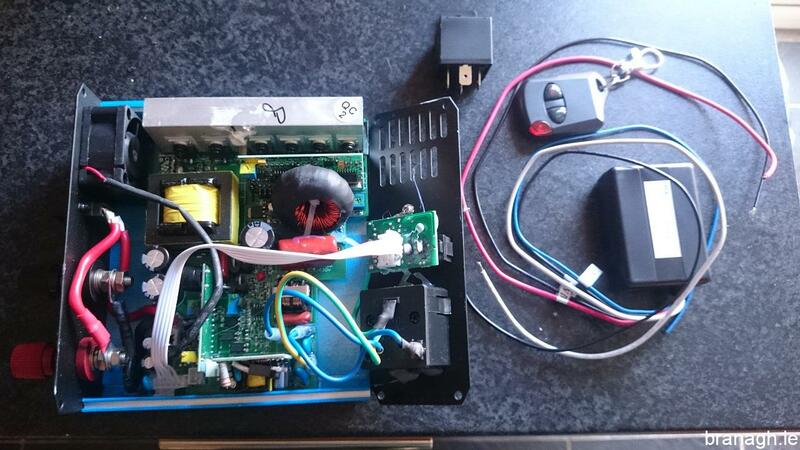 The main components of the solar project including the Raspberry Pi web server. To make use of some of the extra stored energy I added some lighting inside and outside the garden shed where the batteries are. 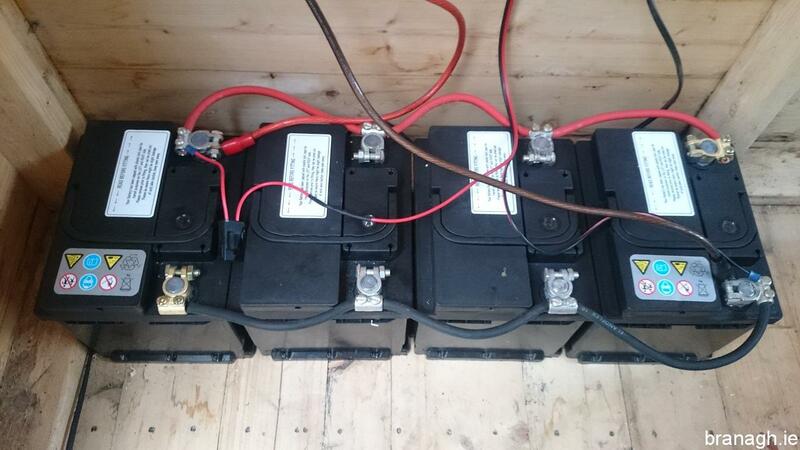 By early April I had brought the battery bank up to four batteries. This then had an advertised capacity of 300Ah although based on the price of the batteries and my experience I don’t believe the battery capacity was anywhere close to what was advertised. The original battery bank of inexpensive leisure batteries. The new Trojan T-105 6 volt golf cart batteries. With a maximum 200 watts of power generation and 300Ah advertised storage capacity, I knew that in spring, summer and Autumn I would be able to run much more than just a Raspberry Pi and some low power lighting. This is why the inverter was added to the project. It is is a 300 Watt pure sine wave inverter as I use it to run delicate electronics like an LCD TV. I was not going to take the risk with a less expensive modified square wave inverter to run this load. 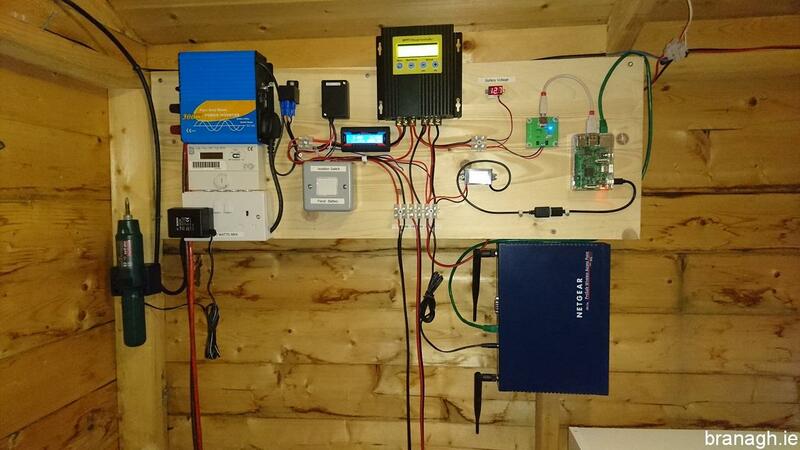 I also added an electricity meter to the output of the inverter to record the usage from solar. Because the inverter is in the garden shed I modified it by adding a radio receiver and a relay to allow it to be switched on and off remotely from the house. 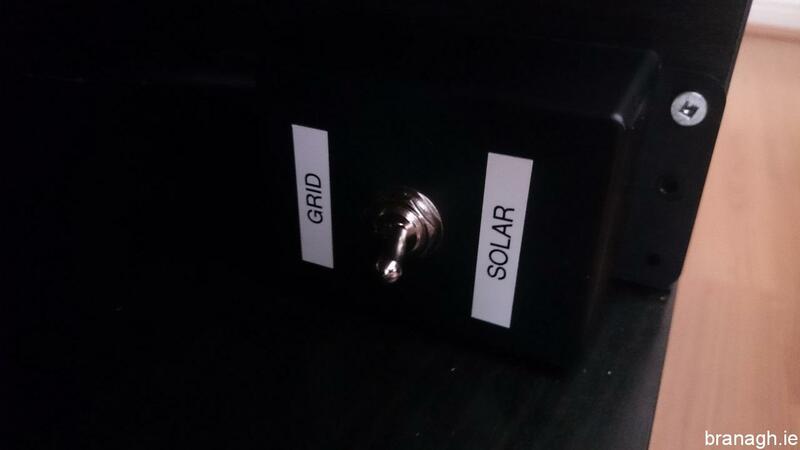 I also created a solar transfer switch to allow the TV and other equipment to be seamlessly switched between mains and solar power. Email alerts are generated by the battery voltage monitoring on the Raspberry Pi which alerts me when it is time to switch to switch to grid power and switch the inverter off. I modified the inverter to allow it to be operated remotely. The DPDT solar transfer switch located where the TV and other connected equipment is. After a few months of using the inexpensive leisure batteries it became clear that they were already beginning to fail. These batteries were basically rubbish for this purpose. This prompted me to invest in new batteries. 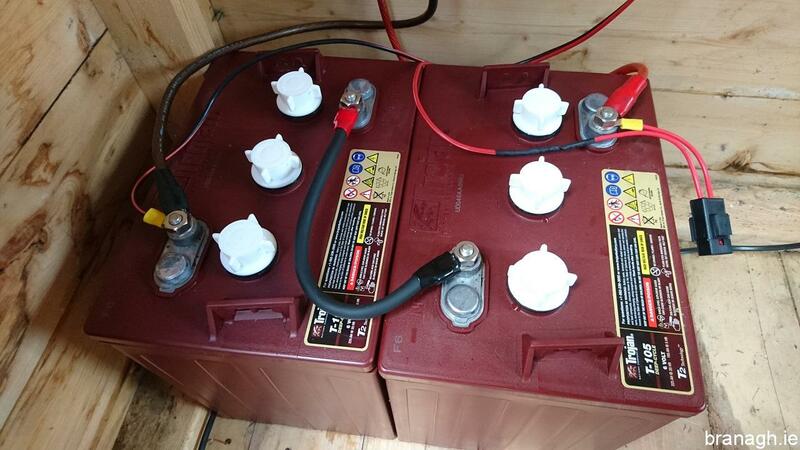 From my research I knew that Trojan T-105 golf cart batteries were the best choice for solar. I also upgraded my charge controller from PWM to MPPT. When fully charged the new batteries will power a load for circa 4 times longer than the old battery bank. With some maintenance they should last for many years.